In Traimit Wat or Temple of the Golden Buddha we have a Buddha statue measuring 3 meters in height and weighing 5.5 tons. It is also made of pure gold. 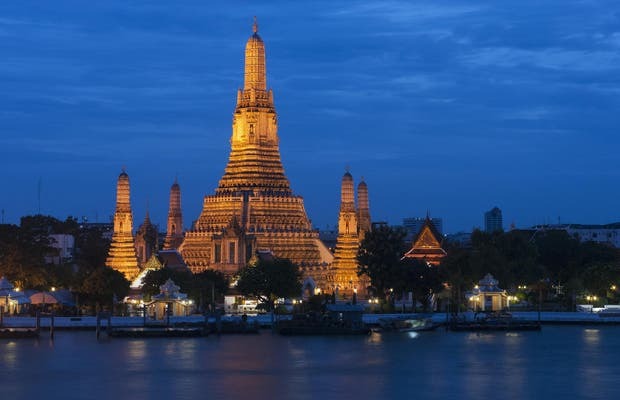 The Wat Arun or Temple of Dawn is in the district of Thon Buri. Its main part measures 79 meters high and in the nineteenth century it was decorated with porcelain. It represents Mount Meru. To get there we took a boat and then made the short walk to the pier for temple. Outdoor vendors were offering fried insects, which obviously tried. After a walk through the neighborhood to experience street life.